In this week’s lesson, Lynda walked us through how to think about the fit of our muslin. She’d put the one she made on a test model who looked like a normal person who wouldn’t need much fitting. But, you could tell that the garment just wasn’t quite right. Lynda explained, in what I found to be a clear and easy to understand way, what changes could be made to improve the fit. And, by fit, she really focused on comfort and wearability. 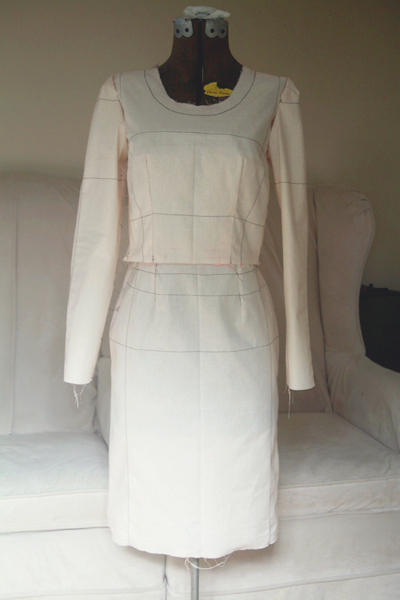 Even her normal looking fit model needed quite a few adjustments to get a well fitted garment. Now, I’d planned to show you the muslin on me today. It is pressed and ready to try on. In fact, I did try it on, both last week and this week, and… Well… I had to finally admit to myself just how much my body is changing right now. The good news is that it’s changing because I’m pregnant. The bad news is that it’s changing faster than I expected. For some reason I imagined I’d have a couple more months before things started growing. I remember friends of mine not showing until they were over half way through their first pregnancy! This pregnancy is actually my third this year – the previous two ended in miscarriages – so I had also wondered if this one would even stick. (And, it still might not, but it’s holding out for now.) I wanted so desperately to take this class, and I thought I could squeeze it in. I figured now was my last chance for awhile. But, it seems I am already too late. And, while I’m sad about the class, I’m also very, very happy to finally be pregnant enough that my body is having to change. And, the very, very happy wins out, to be honest. I’m meeting up with some of the lovely Seattle fitting enthusiasts that are also all taking this class this weekend. I may try to go through the fitting process anyway even though the fitted muslin will likely not fit shortly thereafter, or I may write about my fitting partners’ experiences – if they’re willing, of course. And, even if neither of those plans work out, I’ll still continue to review the class since it will always be beneficial to my sewing, even if my body might be changing too rapidly to be properly fit right now. Congratulations on your pregnancy. I pray you have a healthy delivery and a healthy baby. I’ve been reading your blog for some time now, and really enjoying it. Congratulations on your pregnancy, and hoping that it will be full term and healthy!! Don’t worry about the muslin — put it away for now, and enjoy this wonderful time when your body is changing. I am also taking the class, and fitting my 21 year old daughter in view C, the strapless version. Lynda is just wonderful and so helpful, and I’m learning tons! Perhaps you could fit one of your new friends in Seattle, and learn about fitting that way. Once the baby’s born, and your body is your own again, you can pull out the muslin and do the class! Thank you! And, how fun to know you’re also taking the class. I definitely agree that Lynda is a great teacher and that I’m learning a lot. I’m thankful that the ladies of Seattle are letting me practice her lessons on them! Congratulations. Must be something in the air as this is the fourth pregnancy news I’ve heard today! Wow! Great news! I’m glad to be in so much company right now! congratulations and best wishes for a healthy pregnancy! even though you wouldn’t end up with a muslin perfectly fitted to you, this might be a great chance to learn more about fitting by working with someone else on her muslin! Thank you! And, yes, I have had fun fitting other Seattle ladies. Hopefully some of the lessons stick! BTW your muslin looks great! Amy, congratulations! what exciting news and I am sure you will move on to fantastic fashions of a different category – stylish maternity wear. Sending you good thoughts for a healthy pregnancy. Thank you! I’m hoping I can make a few cute maternity things. Now to find the right patterns! And, thanks again! Congratulations, I hope everything goes well for you! What a lovely reason to put away the muslin. Wishing you a healthy, happy pregnancy. Congratulations! I hope things continue to go well! Congratulations! Hope all continues to be well with the baby and with everything else! Thank you! I’m ever so hopeful, too! Thanks! I’m looking forward to the fitting session in August. If it’s anything like the last one we had, it should be fun! What the what!! Did I miss this announcement?! Congratulations, Amy. I’m so happy for you and hope your body keeps on changing… It will mean all is going well with the baby. Amy, I’ve been reading your sewing adventures for a while now (long-time listener, first-time caller) and just had to pause long enough to say congratulations on your pregnancy. I’m sorry for the losses you’ve experienced earlier this year, and I hope that, as you say, that this one will stick. As for sewing and fitting, what you learn now can be applied later, right? Even if the details (i.e., shape) changes. Again, congrats! Thank you! So far so good with this little one, but you never do know. It’s always more fun to be optimistic though! And, thanks for commenting! It’s always great to say hello! Congratulations!! And don’t worry about the class and your body changing this fast. I’m 3 months pregnant now and there is no way in hiding the bump anymore, bought this class about 3 months ago as well, so it’ll have to wait until the baby is born (along with a ton of other patterns I had just bought). Just be happy and enjoy being pregnant!! Very cool! We’re likely close in progress then! How fun! I read that you bought all of Megan Nielsen’s maternity patterns. I’m excited to read what you think of them! Thank you! And, thanks for commenting! It’s always nice to say hello to readers! Very happy news for you Amy! Big congrats to you and your partner, and I hope you have a wonderful pregnancy experience from here on out. Muslins can wait!! Thank you! And, yes, muslins will wait. I need to start getting creative with stretch fabrics!! congratulations! hope all goes smoothly from here on – sounds like it’s been a tough road for you both. Thank you! I think ups and downs are par for the course for many people unfortunately, but here’s to hoping the third time is the charm! Congratulations, Amy! Such happy news! oh I am so very happy for your and your husband! you will be in my thoughts! Congratulations Amy – what exciting news!!! Your body changing – enjoy every minute, as this is special time. Thank you! Hopefully I’m sewing for my future little one as well as you sew for your daughter! You make some knock out stuff! Congratulations and I wish you all the best! Take care. Many congratulations on your wonderful news. I wish you a happy and healthy pregnancy. 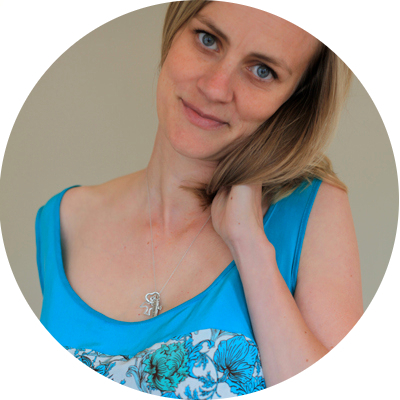 A hearty congratulations, Amy, and much health and wholeness for the next many months! The class on fitting can wait! Thanks! And, yes, it’s definitely going to have to wait! But, I’m having a lot of fun practicing fitting others right now! what wonderful news! You have been through a rough time to get here – very best wishes to you!! Thank you! And, yes, there have been ups and downs, but I think that’s just how these things go sometimes!